With Stanford now five years into a 110-year federal prison sentence, ​Hunton's ​big-dollar settlement is a significant step in a swarm of suits that arose from the 2009 collapse of Stanford International Bank and other companies Stanford controlled. In the instant suit, filed in 2012, the bank’s court-appointed receiver accused ex-Hunton partner Carlos Loumiet and the firm of being key facilitators for Stanford, helping manipulate government officials, insulate him from regulatory scrutiny, and structure transactions for billions in bogus certificates of deposit. If approved by a Texas federal judge, the deal will also leave Hunton's co-defendant Greenberg Traurig LLP — Loumiet had represented Stanford for years at Greenberg before he jumped to Hunton — to fend for itself. 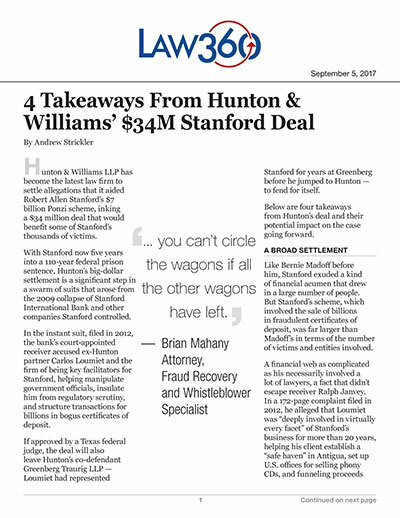 Below are four takeaways from Hunton’s deal and their potential impact on the case going forward. Like Bernie Madoff before him, Stanford exuded a kind of financial acumen that drew in a large number of people. But Stanford’s scheme, which involved the sale of billions in fraudulent certificates of deposit, was far larger than Madoff's in terms of the number of victims and entities involved. A financial web as complicated as his necessarily involved a lot of lawyers, a fact that didn’t escape receiver Ralph Janvey. In a 172-page complaint filed in 2012, he alleged that Loumiet was “deeply involved in virtually every facet” of Stanford’s business for more than 20 years, helping his client establish a “safe haven” in Antigua, set up U.S. offices for selling phony CDs, and funneling proceeds into Caribbean real estate and a slew of other investments. Loumiet represented Stanford starting in 1988 while the lawyer was at Greenberg; he left for Hunton & Williams in 2001, taking the Stanford relationship with him. Along with the two firms, the suit also named onetime Greenberg lawyer Yolanda Suarez as a defendant, describing her as a Loumiet “protege” who later became Stanford’s in-house lawyer and chief of staff. The proposed Hunton settlement, filed in a Texas district court on Aug. 16, is a global settlement for any and all claims against the firm from the receiver, investors and creditors, covering any liability springing from any of dozens of now-defunct Stanford entities, and including a “bar order” on anything related to a U.S. Securities and Exchange Commissionaction. The plan also includes a request of 25 percent of the net recovery — some $8.4 million after expenses — for plaintiffs attorneys’ fees. A settlement approval hearing is scheduled for Nov. 28. The eight-figure deal comes after five years of hotly contested litigation, much of it focused on claims that the firms were liable on a host of aiding-and-abetting claims arising from knowledge of Stanford’s scheme imputed through Loumiet. Both firms have denied knowledge of Stanford's scheme and that they acted improperly. In the context of the larger recovery push, the $34 million would be “one of the larger Stanford litigations to date,” the settlement approval request said. A June receiver report put the total cash collected at $407.8 million as of the end of April. Minus a whopping $159 million in lawyer fees and other expenses, $212 million in net cash remains, of which $94.2 million has been distributed. In terms of BigLaw malpractice claims overall, a $34 million Hunton payout would be a major one. While available data on malpractice judgments and settlements is incomplete, an American Bar Association report released last year found a mere 0.1 percent of all such payouts between 2011 and 2015 topped $2 million. Hunton's payout would also be in line with a $35 million Stanford settlement reached in April 2016 by Chadbourne & Parke LLP. That separate litigation centers on former Chadbourne and Proskauer Rose attorney Thomas Sjoblom, who has been accused of obstructing the SEC and other probes into Stanford businesses. Lawyers for the receiver and an investors committee declined to comment on the Hunton settlement. With Hunton settled out of the case, Greenberg Traurig would be left to shoulder whatever remains of a case plaintiffs lawyers have spent thousands of hours pursuing over many years, going all the way back to the initial SEC action and Stanford’s arrest in early 2009. Jim Cowles of Cowles & Thompson PC, who represents Greenberg, confirmed that he was not involved in the negotiations with the receiver and his client’s co-defendant, and had not been aware a deal had been reached until the August filing. But Cowles said the proposed Hunton settlement would “absolutely not” change his firm’s negotiating position in the case. He also said repeatedly that plaintiffs have not come close to establishing that knowledge of the scheme went beyond Stanford and a few other insiders. “Whatever [Hunton] thought was their exposure or was not their exposure, that’s their business, and it has nothing to do with Greenberg Traurig,” he said. But attorney Brian Mahany, a fraud recovery and whistleblower specialist, said Hunton’s settlement would necessarily put more pressure on Greenberg to reach its own deal. While Loumiet is not a party to the suit, the proposed settlement does include significant legal protections for him. Loumiet would also agree to respond to discovery requests and depositions in the litigation against Greenberg, and make himself available to testify at hearings or at trial. Thomas Ajamie of Ajamie LLP, who represented Walton Houston Galleria Office LP in a Stanford-related conflict of interest case against Andrews Kurth LLP, said the coverage for Loumiet in the Hunton agreement was notable, and likely bad news for Greenberg.